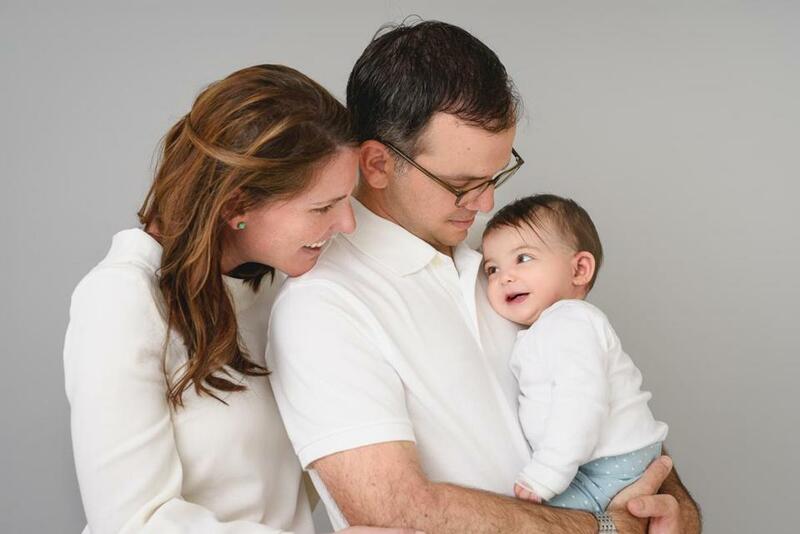 Emily and David Kubik with their daughter, Elodie. In most ways, Elodie Kubik is a typical 19-month-old. She laughs and plays, and loves when her parents, Emily and David, sing songs to her, often dancing when music comes on. 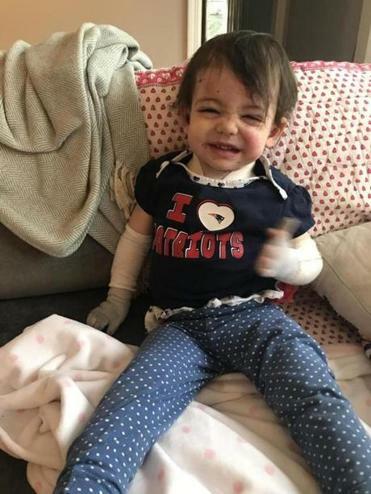 But Elodie, who has a rare skin condition known as epidermolysis bullosa, or EB for short, also faces challenges that most children her age don’t. 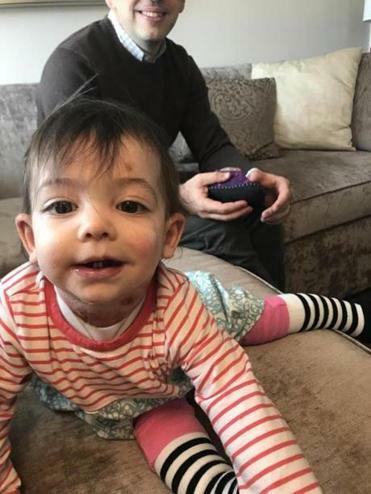 Epidermolysis bullosa causes Elodie’s skin to blister with the slightest contact. EB is a genetic disorder causing blistering of the skin and mucous membranes and results from a lack of collagen VII, a critical protein that binds the layers of the skin together. Without collagen VII, the skin shifts when it experiences friction during daily activities, causing blisters and wounds to form that may never heal. Internal injuries are also common. For Elodie, this means bandage changes multiple times a day. Patients with recessive dystrophic EB, the subtype Elodie was diagnosed with, are susceptible to a very aggressive type of skin cancer. The average life expectancy for a patient with EB is just 30 years, according to a report on EB published in the Orphanet Journal of Rare Diseases. A group of Emily Kubik’s close childhood friends want to change that. They have organized a polar plunge at the Hingham Bathing Beach March 3 to raise money for the EB Research Partnership, where Kubik is a board member. Donations on the group’s CrowdRise page have blown past the organizers’ original goal of $20,000. As of Feb. 21, nearly $90,000 has been donated, mostly from individuals. Elodie with her winning smile. “It’s cool to see people responding and reacting this way to something they haven’t heard of before,” said Kristan Fletcher Khtikian, one of the event chairwomen and a member of the tight group of 11 friends who all attended Wellesley High School. Khtikian and Kubik grew up across the street from each other. Khtikian and Alissa Tofias, another of the friends, were born a day apart in the same hospital. Now scattered across Massachusetts, Connecticut, and New York, the women try to reunite at least once each year, most recently with a girls’ weekend in Westerly, R.I.
Several of the friends live in the Hingham area, so it made sense to hold the plunge at the bathing beach. The Kubiks will make the trip from their home in Greenwich, Conn. Both Emily and David work in New York City, she in financial services and he as an architect. On March 3, instructors from a local gym will help warm up the participants before they take the plunge around 10 a.m. A DJ will shout encouragements on a megaphone. The Woody’s Goodies food truck, a staple at the Hingham ferry dock, will be serving food. “We’re trying to make this a happy event, an uplifting event, something that people want to come to,” Khtikian said. She expects between 100 and 200 participants. All proceeds from the fund-raiser will go to the EB Research Partnership, which was founded in 2014 when two foundations run by families with children with EB — the Jackson Gabriel Silver Foundation and Heal EB — joined forces to fund research in the disorder. Headquartered in New York City, the partnership uses the venture philanthropy model, which uses concepts from principal investing, to fund research. If a therapy or treatment funded by the partnership succeeds and a public company uses that intellectual property, the partnership gets a return on its original investment. It reinvests the money into new research projects. “Every dollar puts speed in research, puts speed in the medicine, and puts speed in driving these treatments to the clinic,” said Michael Hund, the partnership’s director. The most promising treatments for EB on the horizon are gene therapy, which can involve genetically correcting cells and grafting them back onto a patient’s skin, and protein therapy, which can involve applying a bandage with a multitude of tiny microneedles that dissolve and deliver collagen VII into the skin. Raising money for such a rare disease, which Hund said affects 30,000 people in the United States, is in some ways more challenging. “It doesn’t attract the same amount of funding that diseases that affect more people attract,” Kubik said. The tiny number of cases can also make treatment more difficult. Kubik said she and her husband stopped Elodie’s physical therapy sessions because they needed to continually educate the therapists, who were not familiar with the disorder. So the team behind the Plunge for Elodie event hopes to raise not just funds but also awareness. 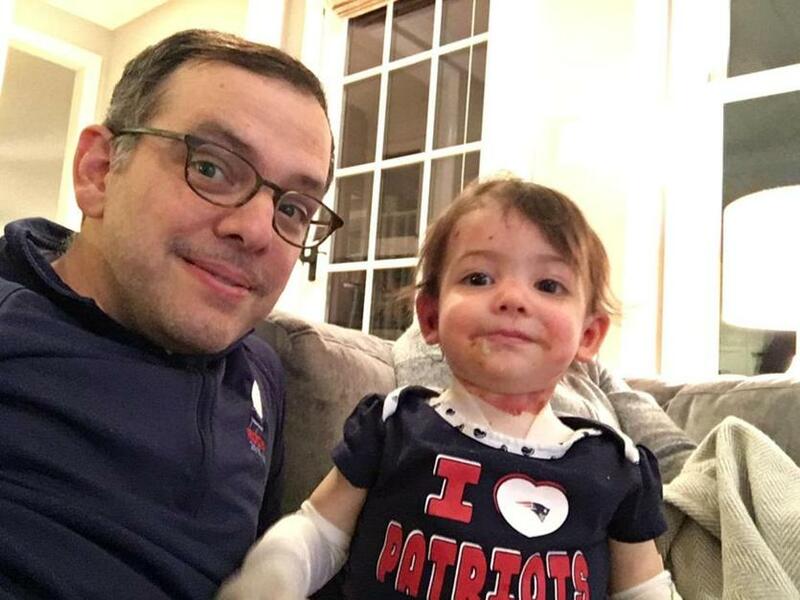 As part of the campaign, Khtikian is encouraging those who cannot make it to Hingham on March 3 to take a plunge from wherever they are and post it on social media with #virtualplunge. Kubik said she is a little nervous about venturing into Hingham’s frigid waters. “It actually sounds kind of awful, but I’m going to do it for my daughter,” she said. The Plunge for Elodie will begin at 8:30 a.m. Pre-registration is not required. For more information about the event, go to www.plungeforelodie.org. “Come one, come all,” Khtikian said. David Kubik and his Elodie.